1. Who did you work with and how did you manage the task between you? For the Prelim, I worked with Monica, but Alistair also helped with the acting. To start with, we brainstormed some conversation ideas, and once decided, I typed up the final dialogue. We managed to split the planning of the task between us as I created a shot list and Monica designed a storyboard. Between us, we came up with a props list and ideas for which media classroom to shoot in. Moving onto filming, Monica did most of the camera work, as I was acting, however I made sure the framing and angles were correct. Lastly when it came to editing, I think we managed to do about half each, me doing the first half to teach Monica how to use the software which was new to her. 2. How did you plan your sequence? What processes did you use? What theories did you try to take into account? 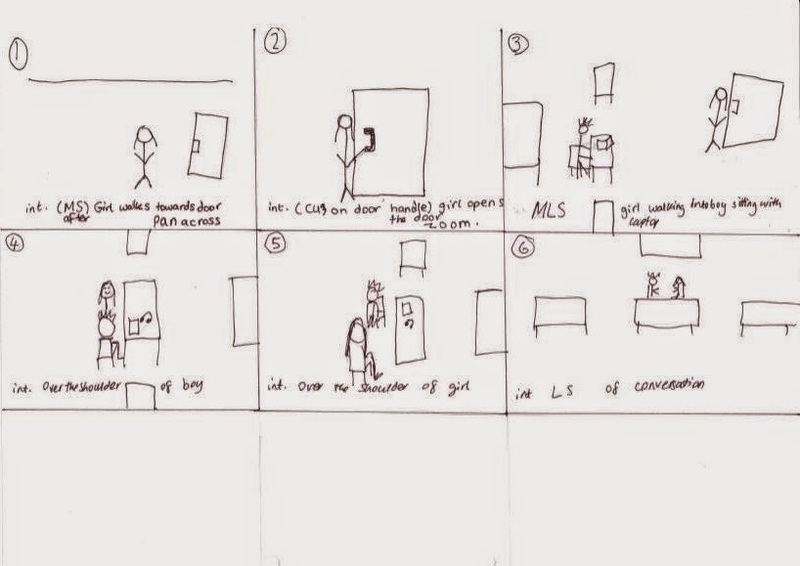 To plan the sequence, we used a storyboard which we adapted once it came to filming. 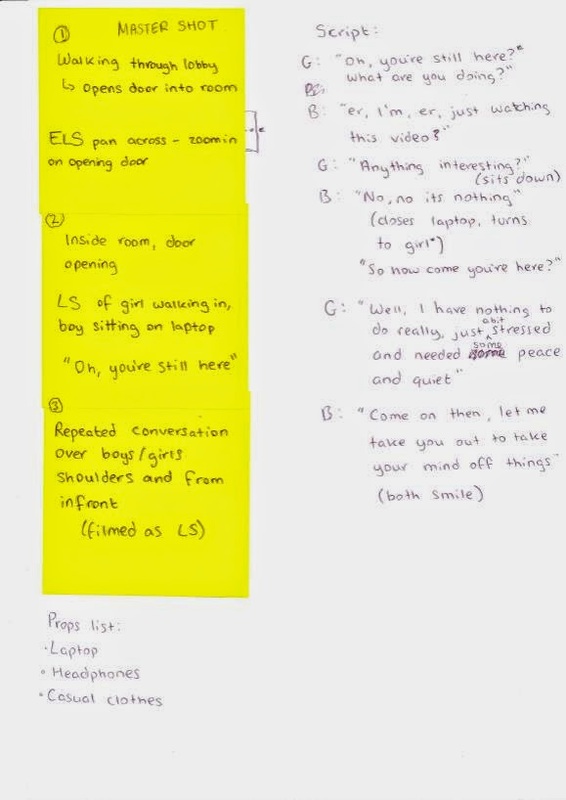 We also came up with a short shot list on post-it notes, with designs of the room underneath, to show where the actors could be and where the camera could be. These methods helped us when it came to filming as we had a plan to fall back on, if any of our new ideas for filming didn't work. We tried to incorporate many different theories into our work, the main one being continuity. When filming we had to make sure that the actions we used were continuous as well as the background, so that when it came to editing the shots, we would be able to match them up without error. We also had to bear in mind, when filming, the 180 degree rule and when editing, match on action. The 180 degree rule is important as if broken it may confuse the viewer, so they cannot make sense of the scene. Match on action is also important because if two shots do not fit together properly, due to the action sequence, they will just look wrong. The second theory we looked at was narrative. Even though we had a very short story it still needs a sense of beginning, middle and end. Our beginning was to be me walking through the lobby and opening the door, moving onto the conversation between Alistair and myself and ending with Alistair's line "Come on then, let me take you out to take your mind off things". Narrative is important so that you get a sense that there is a story line going on, no matter how short the clip. We looked at the genre theory and in order to connote the romance genre, we used the typical scene of boy coming to the girl's rescue (in this case, to make her feel better). 3. What technology did you use to complete the task, and how did you use it? We used a Canon HFG 30 to film our sequence, and were supplied with a tripod and set of headphones to go with it to ensure our shots were as good as they could be, with no background noise or unnecessary movement of the camera. When we were editing we used a programme on the computer called Adobe Premier Pro, this we used to edit the shots and trim them, to make our sequence continuous. We also had a microphone attached to the camera to record any speaking at good volume. Lastly, for some of our shots we used a clapperboard. This made it easier to differentiate the shots from one another as they were then numbered. 4. What factors did you have to take into account when planning, shooting and editing? Firstly when planning, we had to look out for various limitations such as what setting we were allowed to use, ie. what was in the media block and how we could base our story around this setting. Secondly we had to think about timing as when it came to filming, we would only have an hour to shoot, so we had to plan our shot list, in order to make sure we got all shots done in time. When we were shooting we came across even more things to think about. We had to take into account the camera we were using and where we would place it in order to achieve the best shots. We also had to think about what props we would need, for example the laptop and headphones, and where would be an appropriate place to use them (and therefore for the actors to sit) in order to make the sitting in the classroom scenario look realistic. Lastly when filming we had to think about lighting. The room we used would have to continually have the same lighting or else, if say for example we saw a massive shadow which appeared from nowhere, it would be a continuity error. Lastly when editing we had to focus on cutting up the different clips and matching them together, to ensure we had continuity, for example a match on action when the girl was opening the door. 5. How successful was your sequence? Please identify what worked well, and with hindsight, what would you improve/do differently? I think our sequence was successful because we achieved continuity fairly well with just a few little errors and rule breaks. Overall I think we came up with a good script and story line, and our final sequence had some good cuts between shots, for example between shots 1 to 3 of the door opening, I think we achieved a match on action as the shots fit together, one after the other. We also achieved continuity with the shot-reverse-shot which Monica filmed from two different over the shoulder angles, keeping in mind the 180 degree rule. On the other hand we did make a few errors when filming and editing our clip. Looking at some of the shots we didn't end up using, I think we should have taken more than one of each shot from the same angle, so we have more choice. In some cases we did do this, however not always which resulted in us having another person in the background of shot 3 as we didn't have another shot to replace it with. We should also have thought more about framing as some of our good shots cut out parts of the character when they were speaking, so we could not include these in our final sequence. We did make one error in regards to the 180 degree rule, in which we filmed the last shot from in front of the characters, when the over the shoulder shots had been filmed from the other side of them, as shown in the picture below. In hindsight, we should have filmed the over the shoulder shots from over our front shoulders so we could include this last shot without breaking the rule. Overall I think we should we be more careful that we get the right framing and enough variations of each shot, when filming, so we can pick and choose whichever ones are more suitable. 6. What have you learnt from completing this task? Looking ahead, how will this learning be significant when completing the rest of your foundation coursework, do you think? From completing this task, I have learnt that using the clapperboard and headphones when filming really help when it comes to editing as you can organize your shots better and see how many you have of each different shot. I have also learnt that using the headphones when filming is crucial as it is much easier to check if there is any background noise this way. Lastly, I think this prelim task has taught me more about the 180 degree rule and completed my understanding of it. This will all be significant in the future as this small task is mirroring the coursework we will have to soon produce, but on a smaller scale. When it comes to doing our foundation coursework, I think this task will have really helped me as I now understand the 180 degree rule, and how simple it is to get errors when it comes to match on action. As a result, I think that this will convince me to put lots of planning into our final coursework piece to ensure it achieves continuity.